So Rob came home eventually, and it has been very nice to have him. After months at sea, literally working all the time, I think that relaxation is somewhat difficult for him. 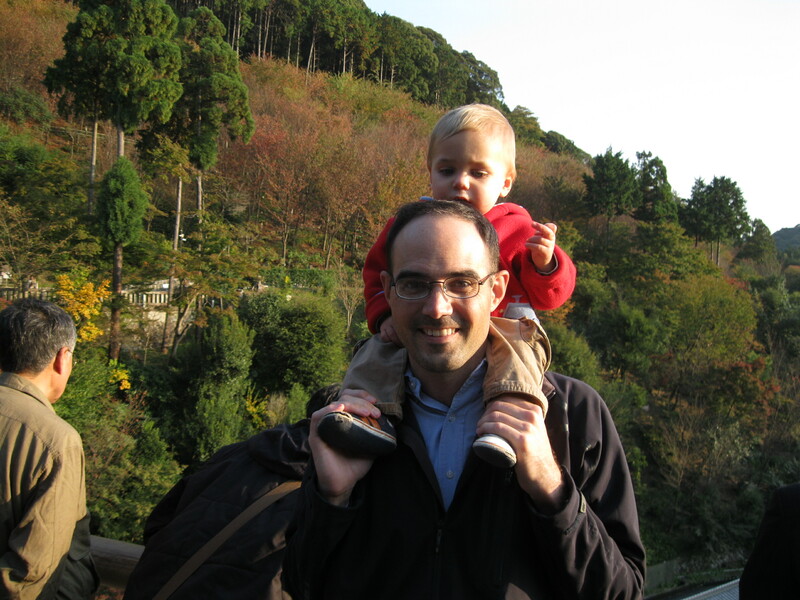 So we seized our Veterans’ Day weekend to take the bullet train to Kyoto. Accidentally, we went at one of the prettiest times of the year: maple leaf season. Getting off of the train at the soaring modern Kyoto station, Kyoto looks like any other city in Japan: miles of pavement and plate-glass. Scattered all over the city, however, are pockets of transcendently beautiful places. I think it helped that we didn’t bomb Kyoto into oblivion in WWII. There are actually entire old neighborhoods, although not as many as one might think. Hushed, elegant, exquisite, composed, contemplative, meticulous: my inner narrator groped for adjectives while I contemplated innumerable scenes of natural and architectural splendor tucked behind gates and walls and twisting streets (that is, when I wasn’t trying to keep Chip from scooping up the meticulously raked rock gardens and throwing bits of them around). 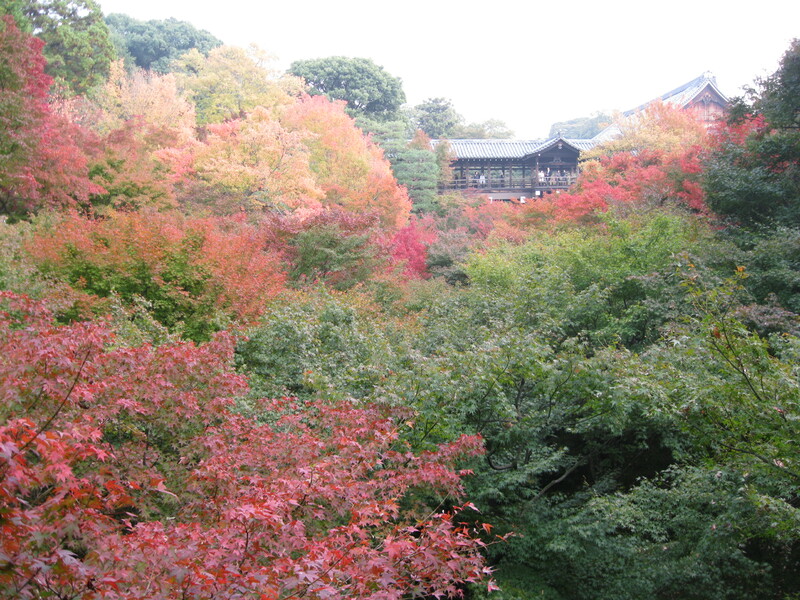 Gazing over the delicate grace of a shogun’s jewel box of a house and zen garden built in 1485, one is acutely aware that one is descended from hairy barbarians who probably didn’t even get around to bathing that entire year much less creating such works of aesthetic perfection. Much better writers than me have described Kyoto, though, just pick up a Fodor’s. Here are some of Rob’s really nice pictures. 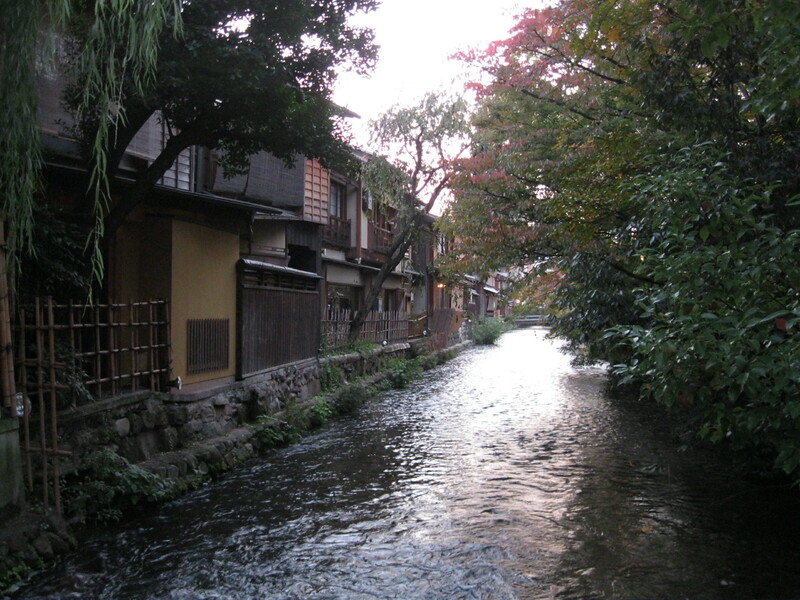 This is the Kiyumizu "Pure Water" Temple. 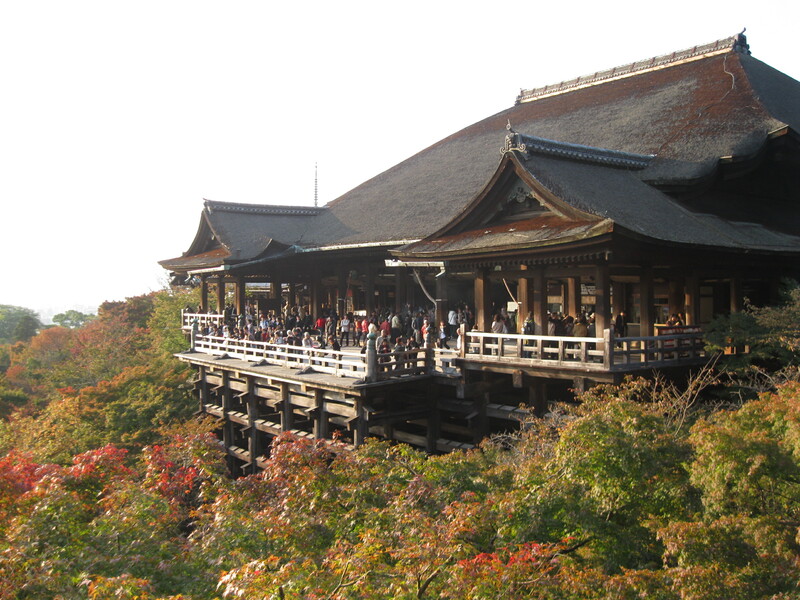 Its verandah is perched high on a cliff, and apparently there's a saying in Japanese that starting a big endeavor is like jumping off of Kiyumizu. Not jumping off the verandah at Kiyumizu Temple. 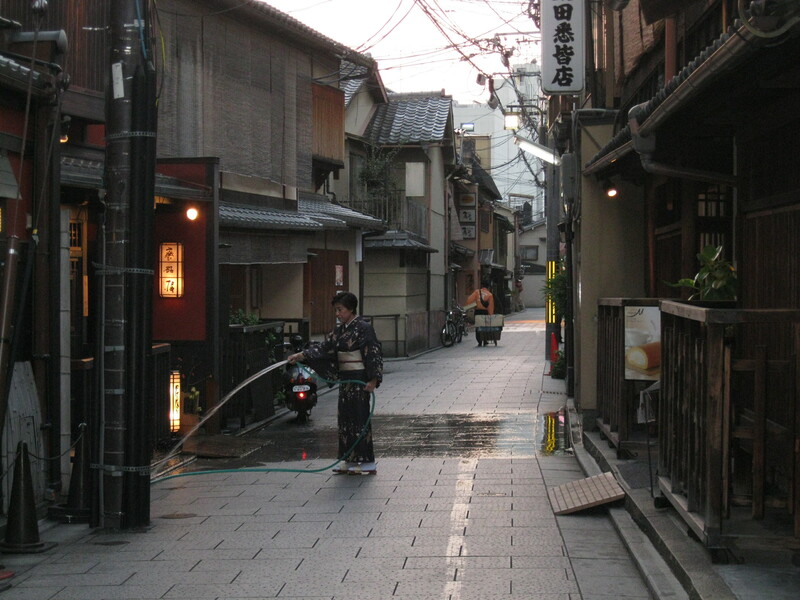 Evening in Gion. Sadly no geishas were spotted. Oh this old thing? This is just my evening chores kimono. 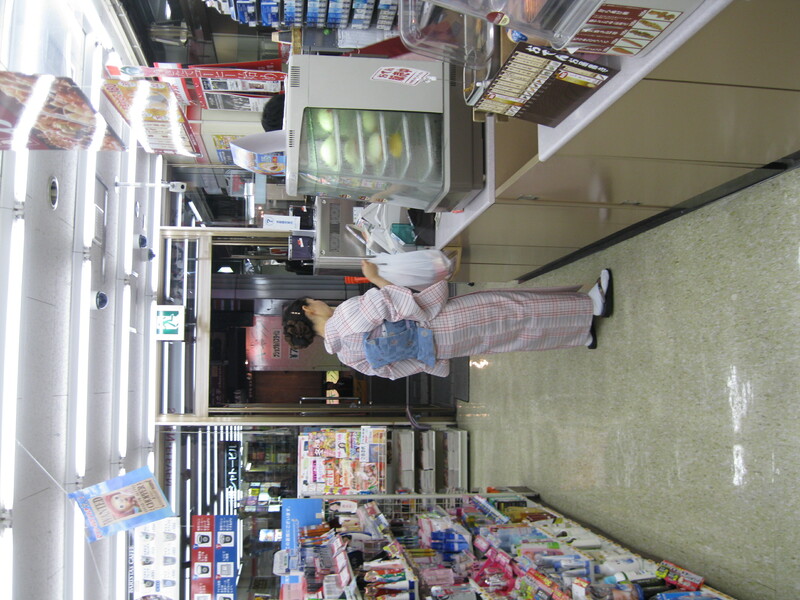 Stocking up for the evening at 7-11. 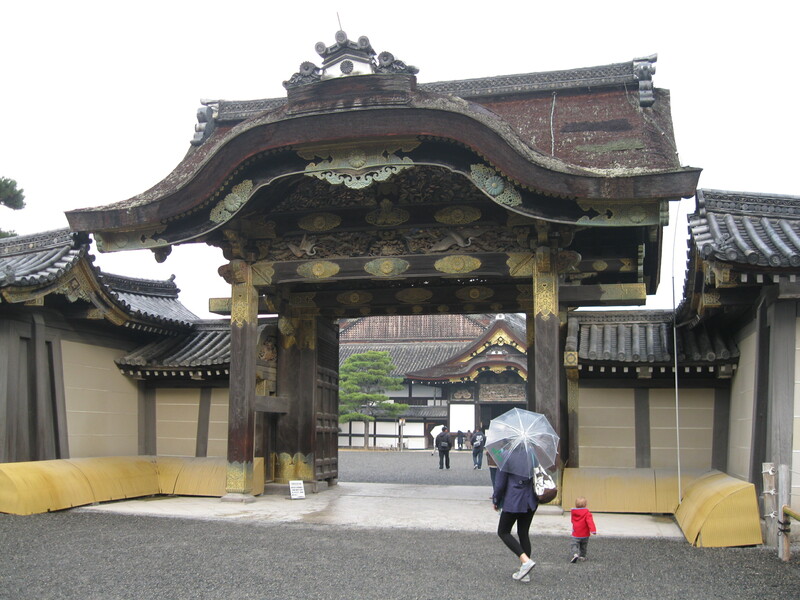 This castle was built by the Tokugawas, the same shogun family that brought us Nikko. The floors inside are called "nightingale" floors: they squeak prodigiously to warn of intruders. 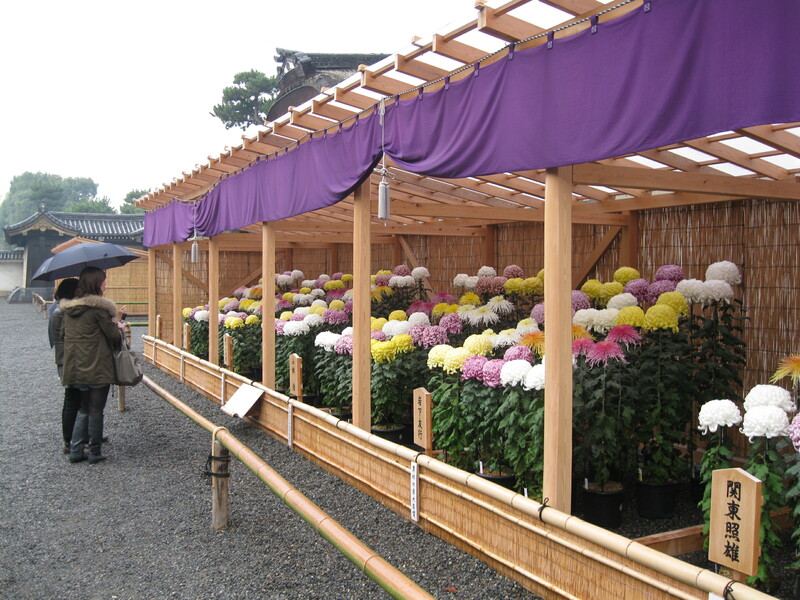 Giant mum display at Nijo-jo. There's got to be a homecoming queen in there somewhere. Chip runs the thousands of torii gates, just like in Memoirs of a Geisha! 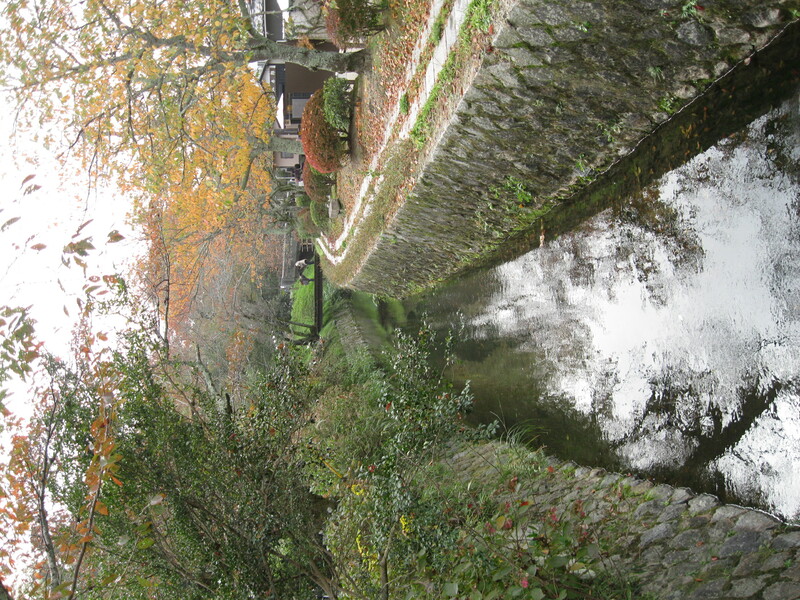 Tofukuji, best place for maple gazing. 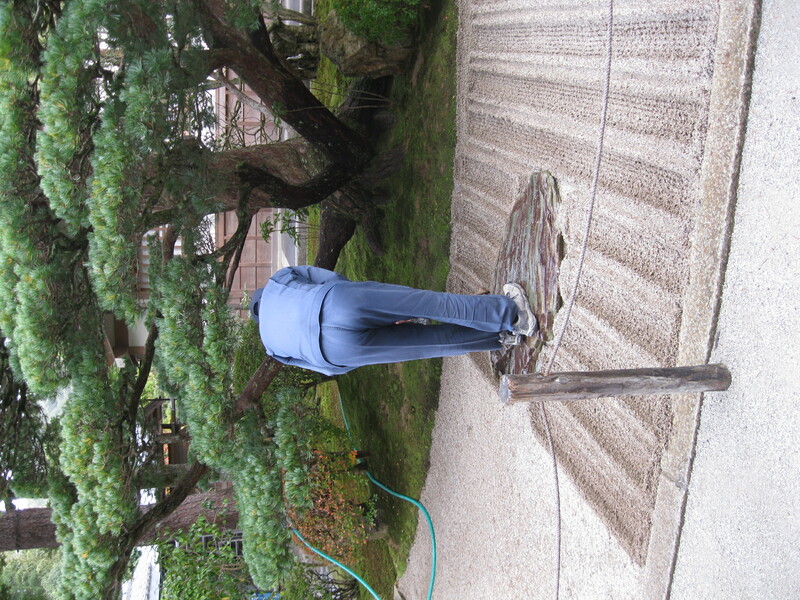 Raking the zen garden rocks at the Ginkakuji Temple. I think that this would be a lovely job. ...and fried potatoes. 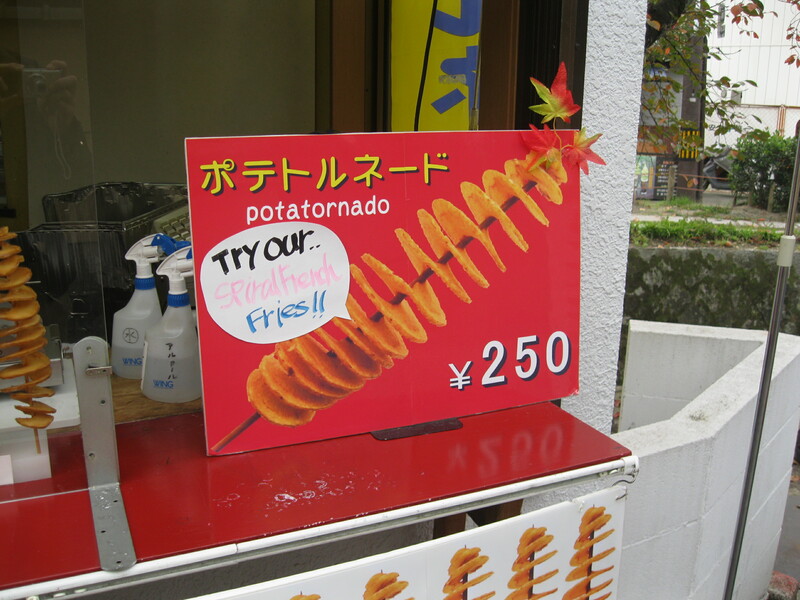 This is Rob's new favorite street food: the Potatornado! This seems like an obnoxious amount of pictures, but we only scratched the surface. 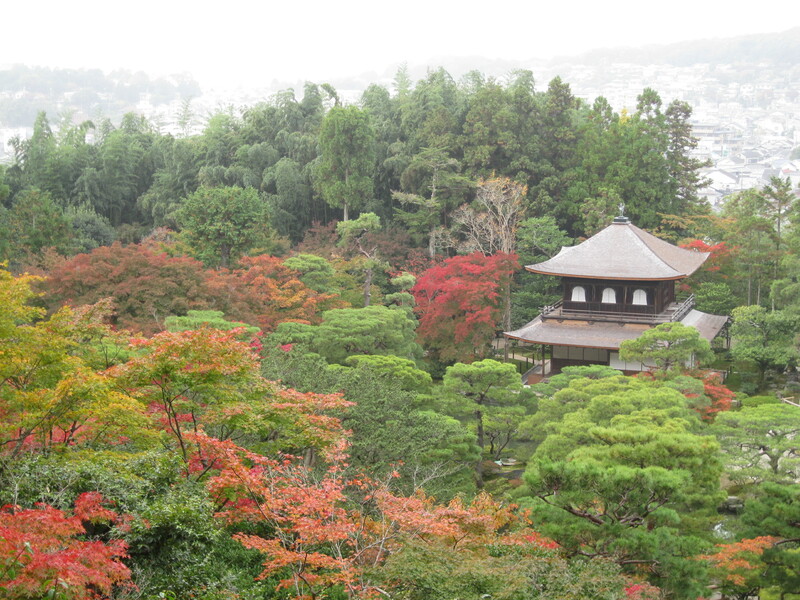 Three-ish days was not enough in Kyoto. We’ll just have to go back someday. Can you tell us more about the torii gates? Why so many in one place? I would love to taste a potatornado. I’ve been missing Wattsabi! BTW, Chip’s red hoodie is adorable. Sorry, I should have done a little research on the Inari torii before I posted the comment. 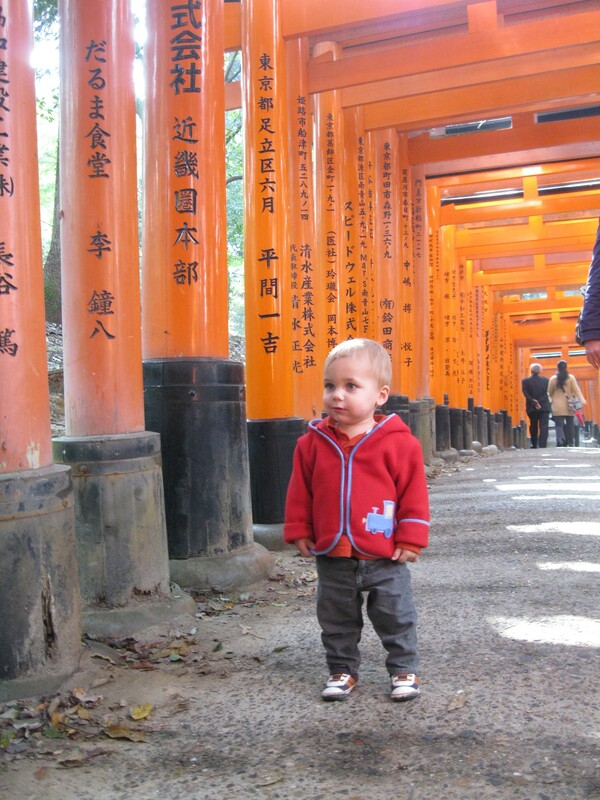 Inari was seen as the patron of business, each of the thousands of Torii is donated by a Japanese business. I know that’s right because I read in on Wikipedia. 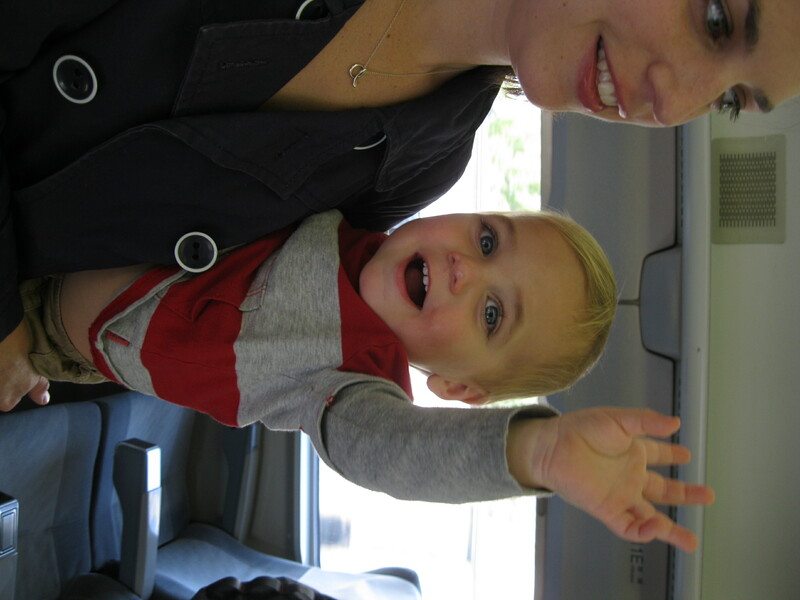 I think you are right, Mama! Inari is also a fox, which made me think of your fox family. Maybe you should put some torii gates up in the backyard for them.